Though I’ve always considered myself a fan of dark side lightsabers and characters, I’ve been on a major Jedi saber tear lately. For whatever reason, almost all of my recent commissions have come from folks looking for basic light side builds with few frills and green, blue, or similar blades. I loved doing the sabers for them, but after doing two or three similar builds in a row, I really needed a change of pace. For better or worse, that change came a few weeks ago when a co-worker with whom I had an excellent relationship moved away for another opportunity. As a major Darth Vader fan, he mentioned to me on numerous occasions that he’d like to have a saber of some sort, but wasn’t sure what he wanted. 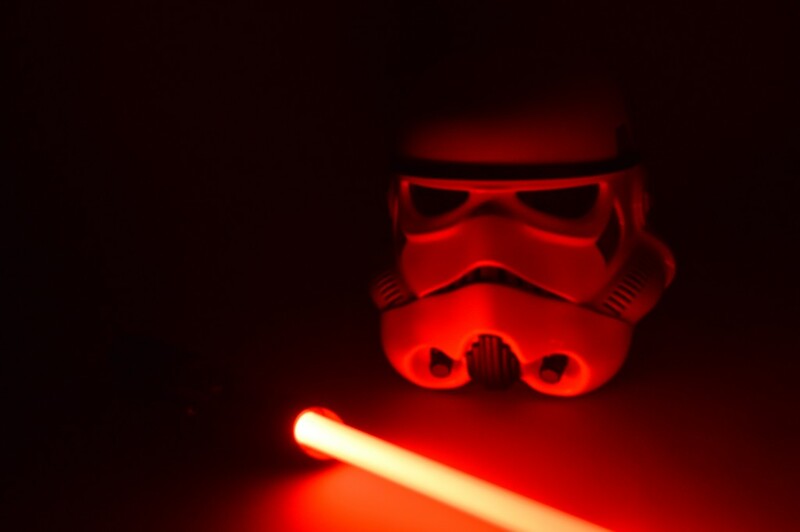 For me, it wasn’t too difficult to connect the dots – he needed a Darth Vader lightsaber replica and I was going to do one for him partly as a going away gift. Today, we will take a close look at the build I did for him. It is based on a Hasbro Black Series hilt that I completely gutted to do a full conversion. 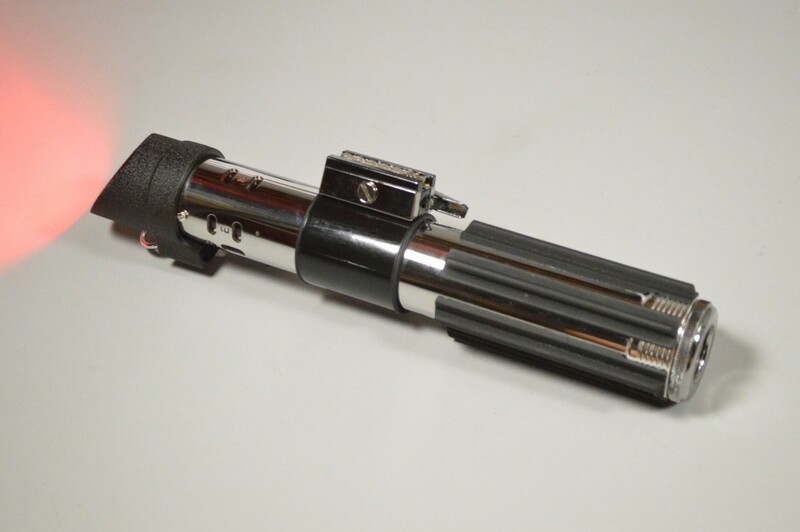 There are a few different Darth Vader replica hilts out there, but for this project, I opted to use the Hasbro model. My decision was based on a couple of factors. First, the Hasbro is cheaper than the similarly-popular Korbanth MPP 2.0. 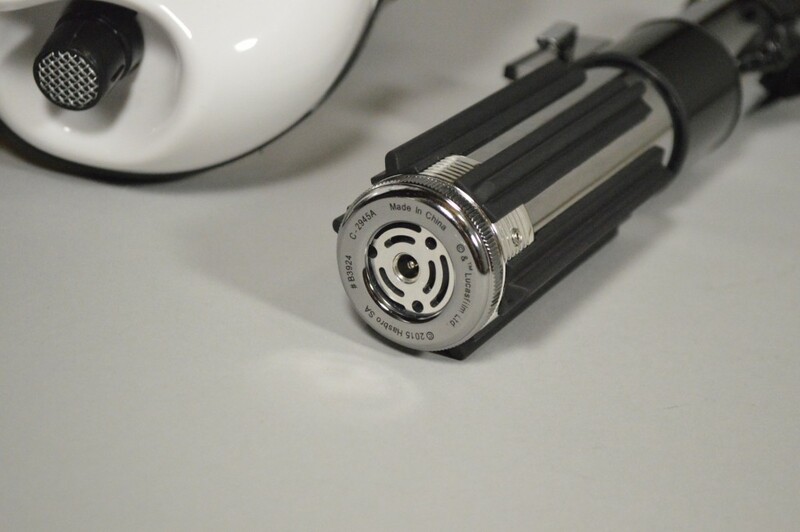 Black Series lightsabers are commonly available for $150 or less. After gutting the electronics for a conversion, it’s also possible to sell the parts and recoup as much as half of the initial cost. Second, it’s more accurate (in some ways) to the original prop than Korbanth’s. 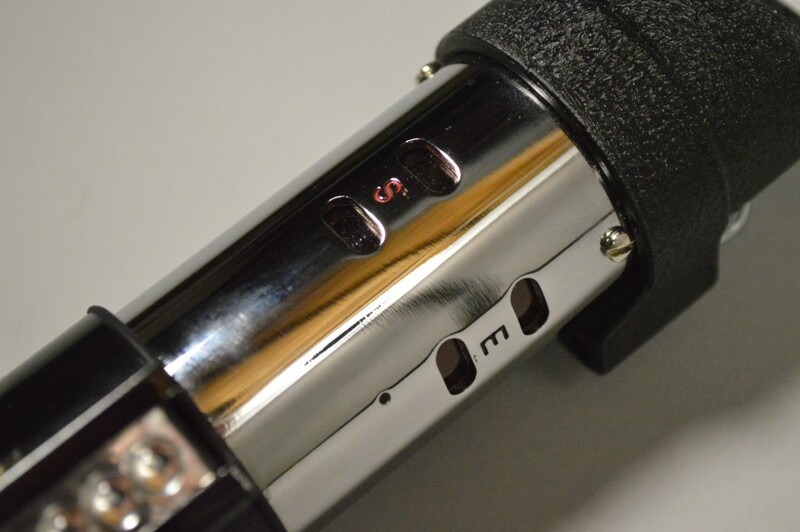 For example, the Black Series saber features the proper B-E-S-E stampings on the upper body of the hilt/”camera flash”. 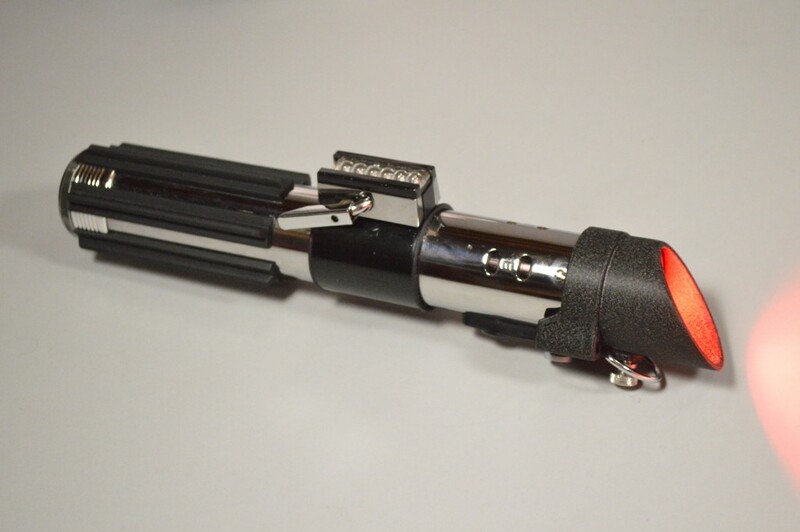 The Force FX Darth Vader lightsaber is a solid replica of the original. The obvious challenge with using the Hasbro saber is that it comes with a fixed, LED string-blade. The LED string isn’t all that durable and is very dim. Because it is fixed to the hilt (not removable), the blade also makes the saber mostly useless as a cosplay piece, at least in my opinion. 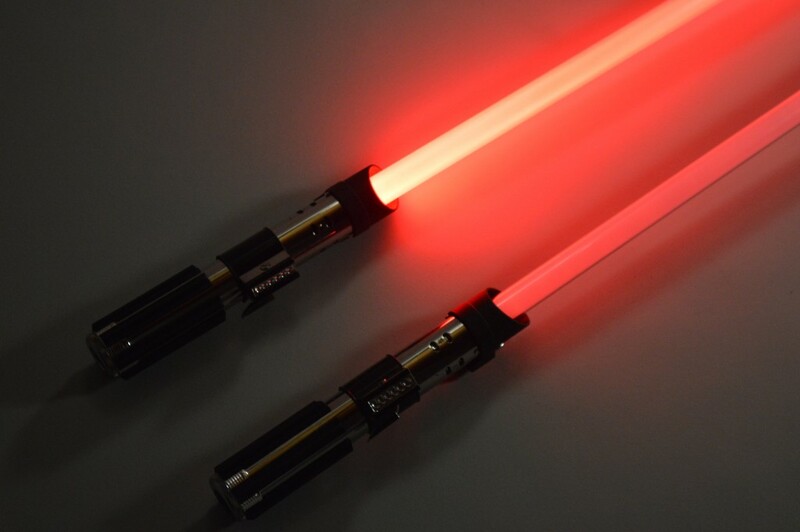 For these reasons, it’s common for builders to convert the Black Series sabers to in-hilt LED configuration. That’s exactly what I did with this project. The top saber is this converted build. The bottom is a stock Force FX saber. The brightness differences are substantial. 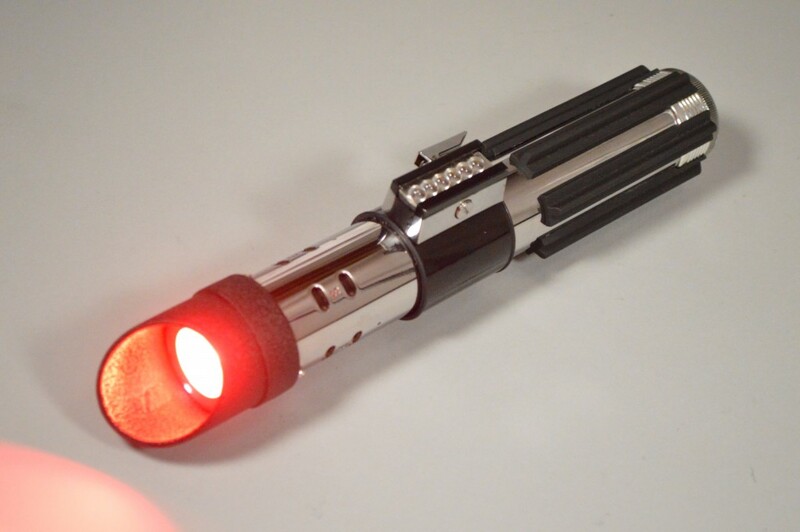 Now, most people just do a basic swap over to in-hilt LED using the kits from The Custom Saber Shop. They generally keep the original soundboard and battery setup. However, I opted to do a total conversion with this saber. Blade, soundboard, battery, and all got swapped out for better components. I still used TCSS’s fantastic conversion kit to house my new blade and LED, but I also exchanged the stock soundboard for NEC’s Spark 2 and the 3 AA batteries were sent to the trash compactor for a single 18650 Li-ion battery. 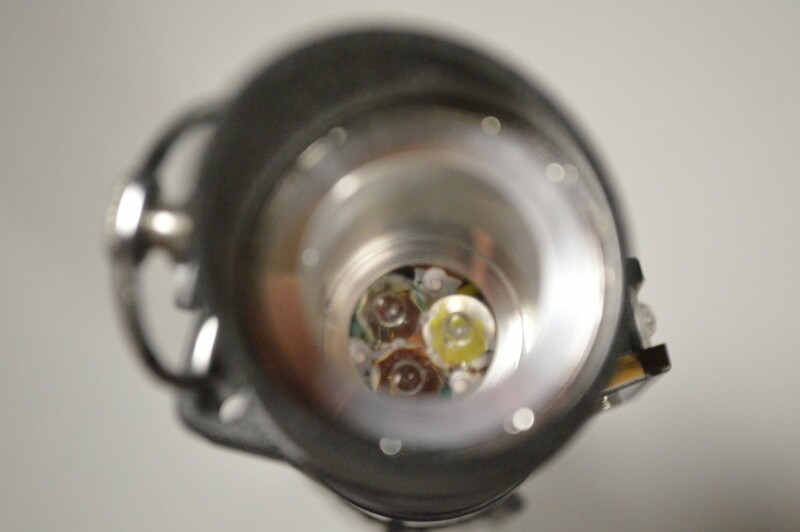 Looking down the emitter shows the TCSS conversion kit along with the Tri-Cree LED. 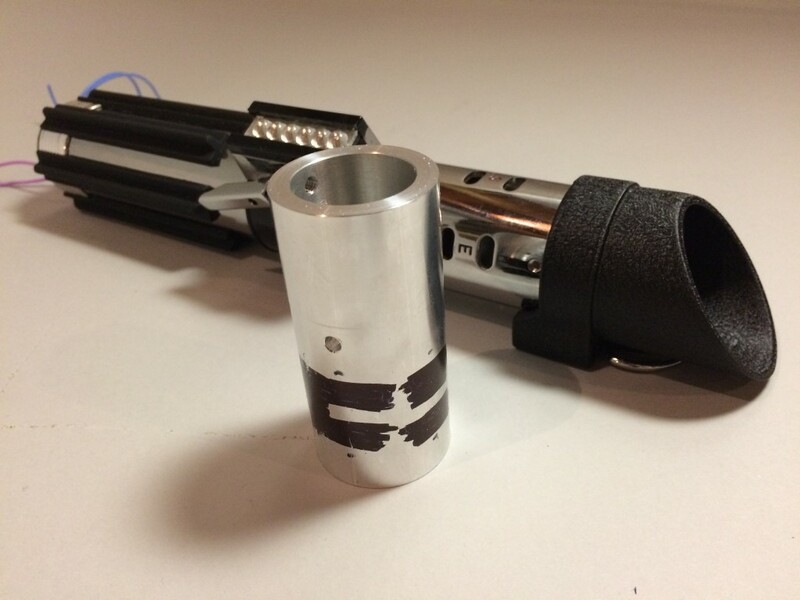 TCSS’s conversion kit for the Force FX Vader saber is incredibly easy to use. Simply unscrew all of the screws near the saber’s emitter (be careful here as some may be glued in), slide in the conversion unit, and replace the screws (save the knurled thumbscrew which is replaced by the kit). That’s pretty much it. Obviously, the LED needs to be wired up, but that’s a separate process. This was the first build I’ve ever completed using a Spark 2 board and I found it to be quite a bit different than the Plecter Labs boards I usually employ. For one, the solder pads are located all over the board. While they are mostly positioned on the edge of the PCB, they aren’t all at one end as is the case with the Nano Biscotte or Pico Crumble. Moreover, though the TruDrive LED driver board is semi-permanently attached to the Spark 2, the pads on the TruDrive must be bridged with corresponding pads on the parent board to be functional. Finally, the Spark 2 supports auxiliary switches for additional functions like blade lockup and blaster deflection effects. For the $79 price tag, NEC has loaded a lot of features into this board. The Spark 2 sitting in its PVC chassis during the early stages of the build. One of the great things about using the Spark 2 is that it supports both latching and momentary switches. The Black Series sabers come with latching activation switches (in this case, the bubble strip on the faux clamp) and I had hoped to keep that functionality. Note that if you do use a latching switch for activation on the Spark 2, you’ll also need to add a momentary switch of some sort to handle auxiliary functions. I opted for a small tactile auxiliary switch that I could bury on the underside of the clamp box. This way, it doesn’t get accidentally bumped during use and is still in a natural spot to deliberately press. The momentary auxiliary switch is tucked in on the underside of the clamp box. 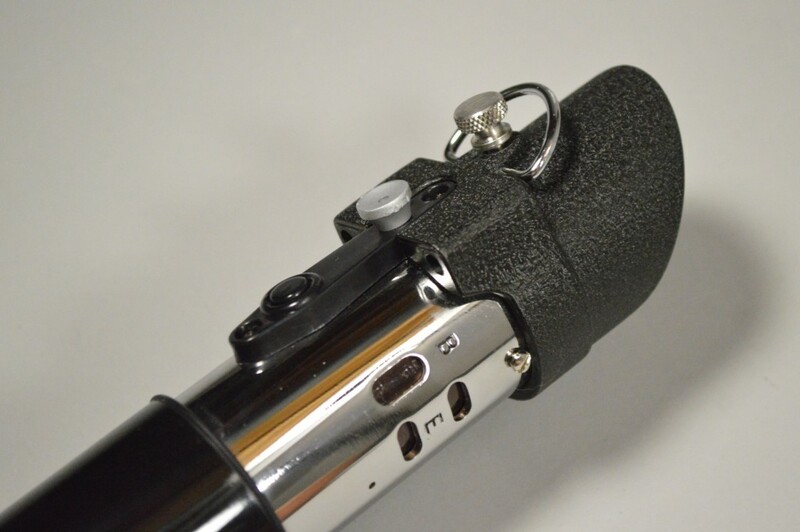 Plenty of folks have used the standard MHS V6 chassis for Vader conversions as the diameter of that part works very well with the inside of the saber hilt. Sure, I could have gone that route, but for this build I elected to use a custom-made PVC chassis. 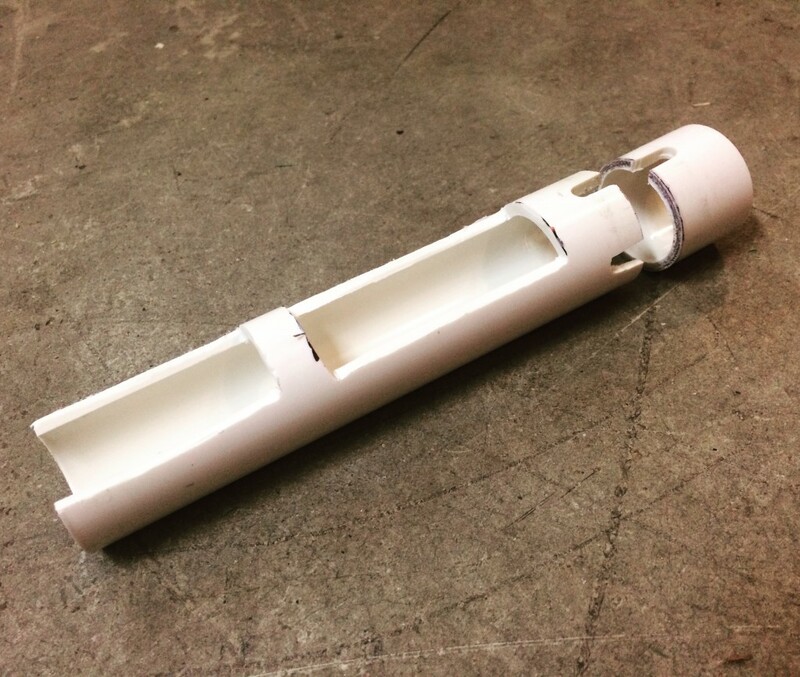 It turns out that 1” schedule 40 PVC pipe fits almost perfectly inside the Black Series hilt. I simply cut an appropriate length of some scrap pipe, notched it to fit the Spark 2 and a battery, added a place to install the speaker, and then created a sleeve from the same PVC to give enough room between the speaker and the pommel for the recharge port wiring. When I was done, I painted the chassis silver. There are several chassis-related changes I would like to make on future builds. Namely, I would like to move the recharge port from the pommel to just behind the speaker. 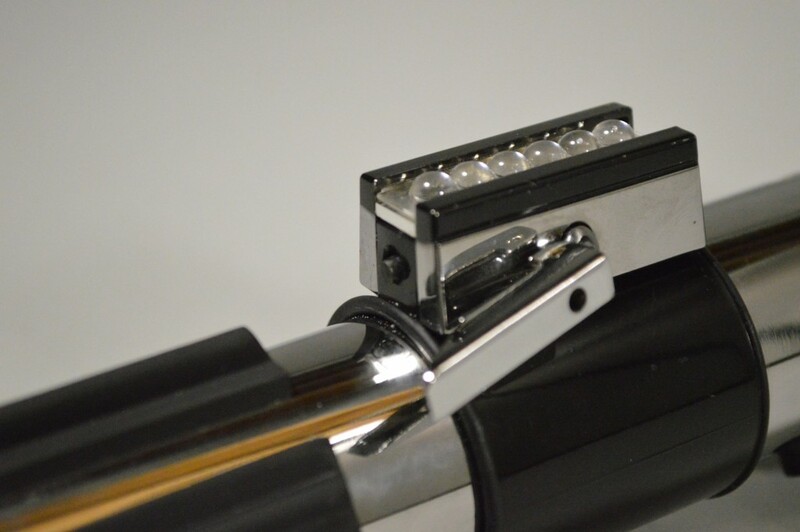 This would allow for a one-piece chassis that would be easier to remove and more durable. From a motion detection perspective, the Spark 2 and the Nano Biscotte V3s that I’ve used previously are almost opposites. The Nano Biscotte has superb clash detection, but needs some tweaking to get the swings correct. The Spark 2 has excellent (perhaps too sensitive) swing detection, but poor clash registration. This too is easily corrected inside the configuration settings. It took me some time to get this saber just right, but in the end, I think it came out nicely. 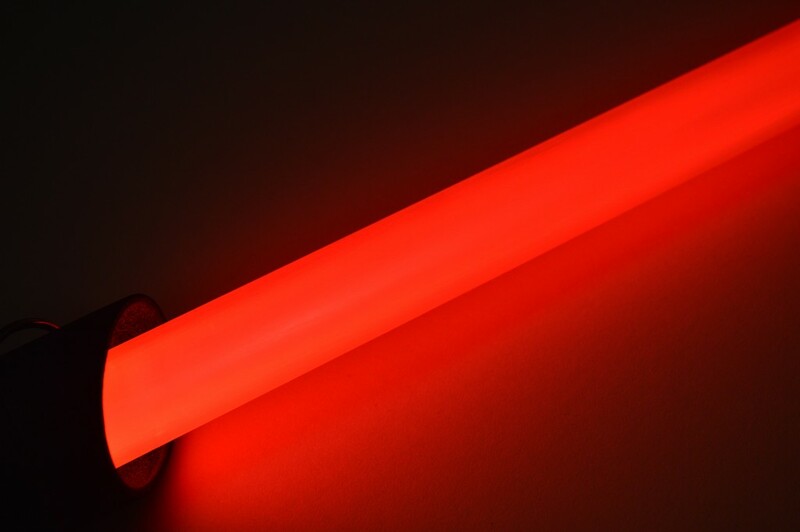 Single die, in-hilt LEDs are typically far brighter than the LED strings used in the Black Series lightsabers. Tri-Cree LEDs absolutely destroy the stock setup. For this build, I chose a Tri-Cree red, photo red, white star from TCSS. The red die appears brighter than the photo red one, but it has a noticeable orange hue. The photo red is a pure red that doesn’t quite match the perceived brightness of the standard red LED. Combining the two captures the best of both worlds, producing a full-bodied red with plenty of brightness to be worthwhile. The white die is reserved for flash-on-clash (for the most part). Converted Vader on top, stock Force FX on bottom. The Spark 2 has three sound font banks, each of which can hold 99 different sounds. These sounds can include idle hum, activation/deactivation sounds, swing and clash sounds, blade lockup effects, and blaster deflection sounds. It also sports a fourth slot called Saber Tracks, which allows users to load music or other WAV sounds to the micro SD card that comes with the board. I retained two of the three default sound fonts from the Spark 2 – Father’s Son and All Too Easy. Father’s Son is a Luke Skywalker inspired sound font with a prominent hum, and a variety of swings and clashes. For this bank, I actually modified the LED settings to pump in a little of the white die, making the blade lean more toward pink. The All Too Easy font is a basic Darth Vader sound font that fits this hilt perfectly. 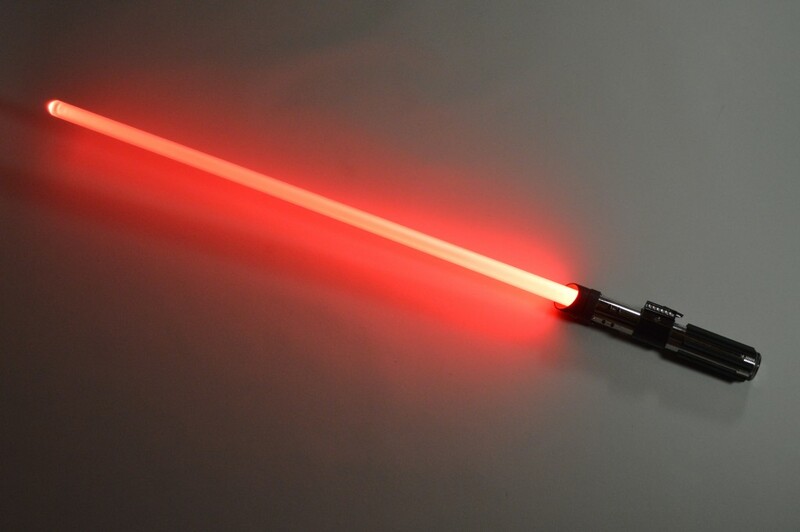 It offers a more stable hum than Father’s Son, which matches the relatively static blade of Darth Vader’s lightsaber. In the remaining sound bank, I loaded VadeR1 from Lord Blako. This is a superb Rogue One inspired sound font. The effects that come in the package closely replicate the sounds from Vader’s ending scene in the film. Notably, the dramatic activation sound from Rogue One is present with this font. I highly recommend all of Lord Blako’s work, but VadeR1 is especially excellent. 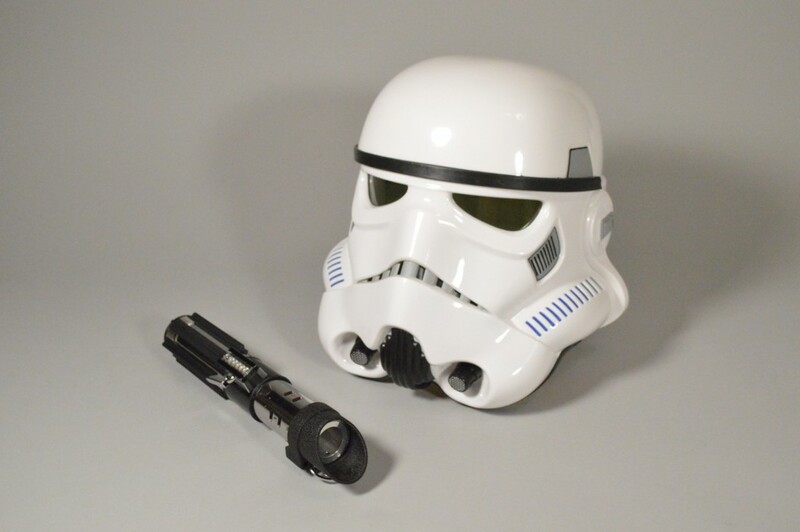 This saber uses the standard 28mm bass speaker made by Veco and sold by TCSS. It’s a fine speaker that’s loud and produces strong bass tones, but it could use a little help in the clarity department. This was the first saber I’ve done with a recharge port. One of the biggest worries I have when doing a custom build is that a customer will damage wiring while removing the battery for charging. Since this saber has a 2.1mm recharge port in its pommel, my buddy shouldn’t have to ever open the hilt up (unless he plans to install different sound fonts). The recharge port also facilitates the use of a kill key to prevent battery discharge when idle. A look at the pommel-mounted recharge port. 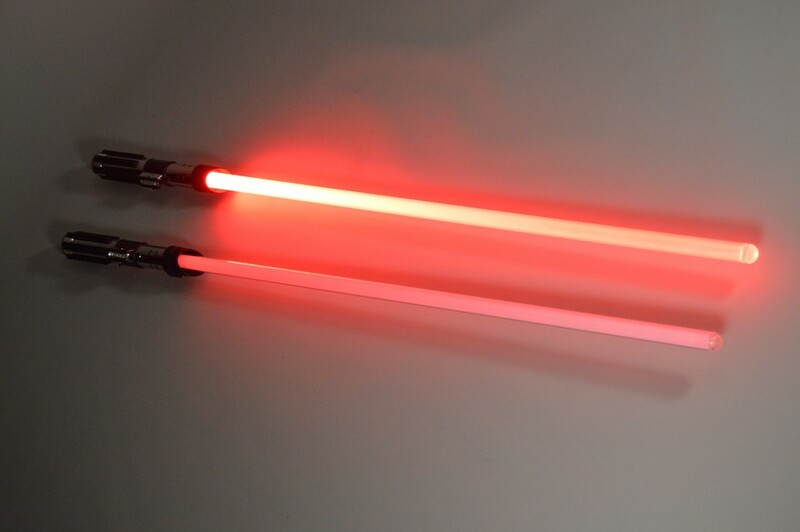 Lastly, the blade I sent with this build was a heavily sanded Ultrasabers Mid-Grade. I like the Ultrasabers blades for their affordability (especially if you choose the grab bag option) and overall appearance. 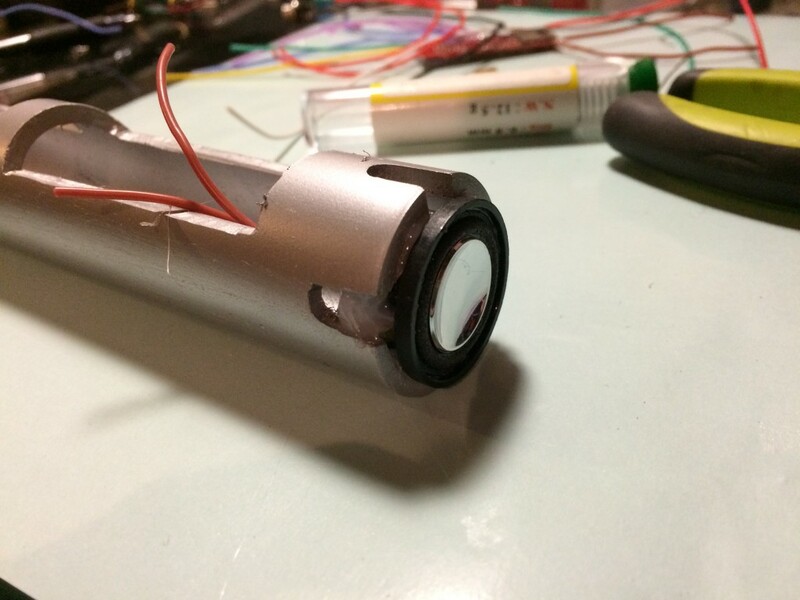 The sanding helps to increase light diffusion and reduce the “light in a tube” effect that is caused by the blade’s clear wall and cellophane diffusion film. For this, I used 150 grit sandpaper, but I’ve used all the way up to 800 grit with similar results. I think that effectively covers all the major details of this saber. If you have any questions, be sure to post them in the comments. Thanks for stopping by and be sure to check out more builds from Arms of Ilum. Thanks for the help! Amazing article, thanks for the help. Do you have a recommended wiring setup for the white vs red LEDs? I know there manual specifies not to use more than 2 LEDs in series for less battery drain. I can’t wait to get started on this. Your YouTube video has inspired me to fix my son’s broken black series. The Led strip starts to light up then the thing shuts down as it gets about halfway up. Hey George, I am glad to hear that the video inspired you to fix your son’s saber! If you’re using a Nano Biscotte or a Spark2 (or any soundboard for that matter), I would advise against wiring any of the dice in series. Instead, I would wire the 2 reds in parallel to the same pad on the board. The white would then go onto a separate pad to control flash-on-clash via the second channel. 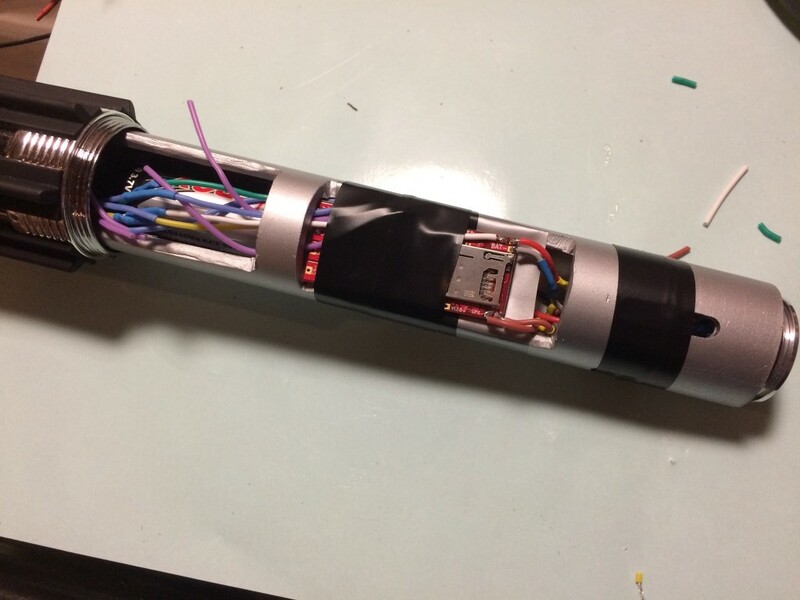 For instance, on this saber, I wired both reds to C1 and then had the white on C2. I hope this helps. Please let me know if you have any further questions. Where can one obtain the components for this conversion? Is it a DIY project? What are the costs for the parts? I;m currently in the process of converting my 2005 MR Anakin, and I would love to do the same for my Hasbro Vader. However the pommel is long since lost and i cant find one anywhere-ebay, hasbro, saber forums etc. Do you know anywhere i could get one or something that would function as one? I am wondering about the wiring involved to connect the LED’s, switches, battery, etc. Are the schematics included with the Spark 2 board?